It only took one song, the organ-driven number one smash "96 Tears," to make ? & the Mysterians into garage rock legends. Eccentric frontman Question Mark (actually spelled "?," once he had his name legally changed) cultivated an aura of mystery by never appearing in public without a pair of wraparound sunglasses; he frequently claimed he had been born on Mars and lived among the dinosaurs in a past life, and that voices from the future had revealed he would be performing "96 Tears" in the year 10,000. On a more earthly level, the Mysterians' sound helped lay down an important part of the garage rock blueprint, namely the low-budget sci-fi feel of the Farfisa and Vox organs (most assumed that "96 Tears" had featured the former, but ? later remembered using the latter). What was more, they were one of the first Latino rock groups to have a major hit, and ? 's sneering attitude made him one of the prime suspects in the evolution of garage rock into early punk. The Mysterians were formed in 1962 by bassist Larry Borjas, his cousin, guitarist Bobby Balderrama, and drummer Robert Martinez; they soon added vocalist ? (the general consensus is that he was actually Rudy Martinez, Robert's brother, though a few sources identified him as Reeto Rodriguez) and organist Frank Rodriguez. By most accounts, all the musicians were born in Texas, of Mexican descent, and grew up in Michigan in the Saginaw/Bay City area. Taking their name from a Japanese science fiction film, the band played its first gigs in the small Michigan town of Adrian in 1964, and soon moved its home base from Saginaw to Flint. Larry Borjas and Robert Martinez were both forced to leave the band for military duty, and were replaced by bassist Frank Lugo and the Martinez brothers' brother-in-law, drummer Eddie Serrato. Shortly afterward, ? wrote the lyrics a song he called "Too Many Teardrops" and showed them to the rest of the band; the title was changed first to "69 Tears," and then the less suggestive "96 Tears." The song became a hit at the Mt. Holly ski lodge/dancehall, where the band played regularly, and in early 1966 they recorded it for the small local label Pa-Go-Go, owned by the band's manager. It became a regional hit in Flint and Detroit, attracting interest from several major record companies; ? decided to sign with the Philadelphia-based Cameo-Parkway, chiefly because their label was his favorite color, orange. Now blessed with national distribution, "96 Tears" raced up the pop charts and went all the way to number one in the fall of 1966, becoming one of garage rock's all-time classics. The band's first album, naturally also titled 96 Tears, was released by the end of the year, as was its follow-up single, "I Need Somebody," which just missed the Top 20. Released in early 1967, "Can't Get Enough of You Baby" was a minor hit, but the group's second album, Action, sold disappointingly; moreover, Cameo-Parkway was experiencing financial difficulties, and was later taken over by ABKCO chief Allen Klein. The Mysterians departed, recording singles for Capitol in 1968 and Tangerine and Super K in 1969, to no commercial avail (during this period, bassist Mel Schacher served a short stint in the group prior to joining Grand Funk Railroad). They also cut an album for Ray Charles' TRC label that went unreleased.
? regrouped the band in the early '70s and tried again, recording singles for Chicory in 1972 and Luv in 1973 to no response. Bobby Balderrama formed a short-lived band called Inflight during the '70s, and ? left music to become a dog breeder. ? & the Mysterians reconvened in 1978 to cut some demos with producer Kim Fowley, and played a reunion concert in Dallas in 1984, the tapes of which were later released by ROIR; that year they also opened some gigs for Tex-Mex rocker Joe "King" Carrasco. In 1997, ? was directed by the voices he heard from the future to reunite the group again, with a lineup of Balderrama, Rodriguez, Lugo, and brother Robert. Since Allen Klein refused to reissue any of the group's original recordings (or even license "96 Tears" for compilations — hence its absence from Rhino's mostly comprehensive garage rock box set Nuggets), they re-recorded their debut album for Collectables and released it as Question Mark & the Mysterians. In 1998, they issued a live album on Norton Records, Do You Feel It Baby?, that was recorded at Coney Island High and received warmly by their cult fan base of garage rock aficionados. 1999 brought the release of another, somewhat better-produced two-disc set of re-recordings, More Action, this time released on Cavestomp (it was later condensed into the 2001 single-disc release Feel It! 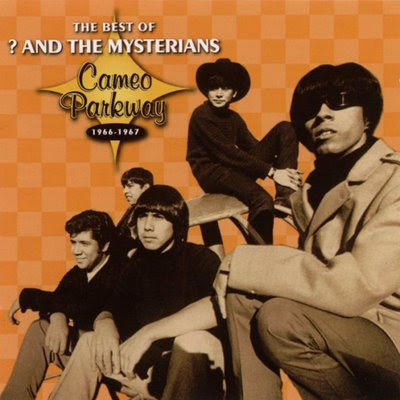 : The Very Best of Question Mark & the Mysterians). Meanwhile, Balderrama formed the Robert Lee Band, a blues outfit that played around Michigan and recorded an eponymous album for the local Bullfrog label. Unfortunately, there remains no official CD release of the Mysterians' original recordings.